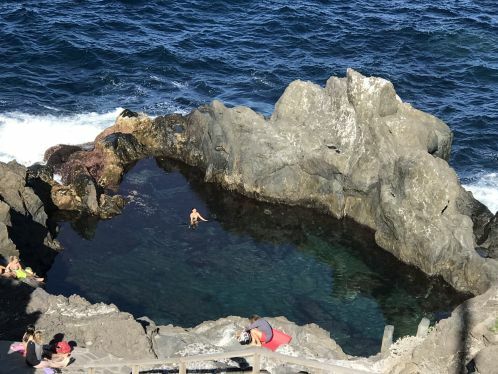 Is Charco La Laja a tourist trap? Of course, Charco La Laja is not a tourist trap but more about this just now. The breathtaking beauty of the Charco or Charca with its picturesque serpentine stone stairs has geographic and ecological reasons. Where is this bathing idyll? 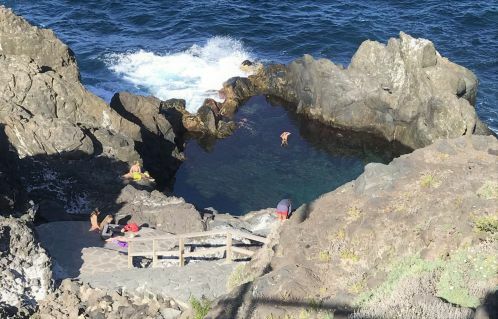 This ocean Charco that looks like a lagune nests deep down below a rocky outskirt of San Juan de la Rambla by the Atlantic Sea. Its often ferrocious tidal waves have molded it over time. It's now a coastal jewel that resembles a turquoise gemstone. An astounding color for an early 2019 Winter afternoon on January 16. Volcanic Colades and Basaltic Pyrioclasts created what looks like a romantic haven in a peaceful environment. There, sun bathers on unequal, rocky terraces gaze daydreaming into the calm pond below. Giant boulders flank protecting on the right. On the left, more jagged ones portray a contrast of menace. 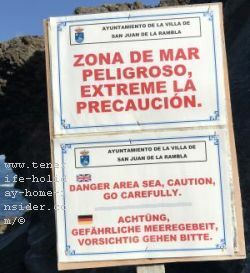 Why a danger board in three languages? The natural barrier that separates the enclave from the Atlantic isn't safe enough. In fact, warnings are up for a reason, as the board beside clearly shows. Unfortunately, tourists often ignore danger boards just like red and yellow flags by beaches, as I could witness last year. Notice where the girl that swam stands by the mini breakwater in my little video. By the way, I took friends to the Charco which I love so much at the beginning of February 2019. Red flags were on many Tenerife beaches on that day. Well, the Charco de la Laja was totally cordoned off. Big red signs warned not to enter the area because of dangerous waves. This shows you how concerned the people at the town hall are now to prevent that tourists or locals may be harmed. Tidal waves on a windy day will overtake with force. It will claim the innocent bather. Then, uncontrollable currents will make it impossible to return to the shore. In fact, four Lithuanians who were in the main pool were washed out to sea on January 16. One of two rescue helicopters could only save two, one of which had sacrificed his life trying to help. 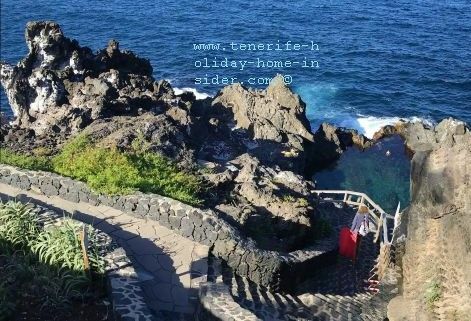 I saw about 20 tourists, most of which were coming and going within the half hour I have spent there in the mid afternoon on a Tenerife winter day. Only Titsa bus 363 take you to the center of San Juan de la Rambla near the farmacy Farmacia Los Castaños. From there, walk or drive right into C/Los Sabadeños and continue straight to the Laja. 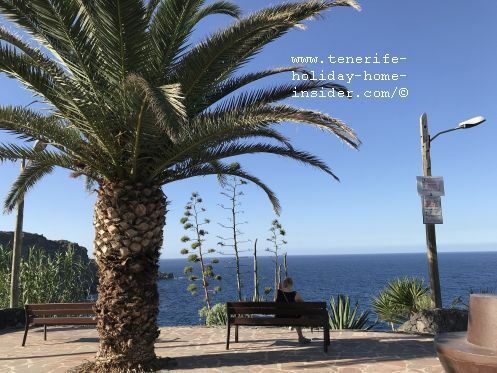 A bus stop to return to Puerto de la Cruz is only by the freeway TF5, one of which is opposite Calle de la Luz where Titsa 108 also takes you back to the capital Santa Cruz. 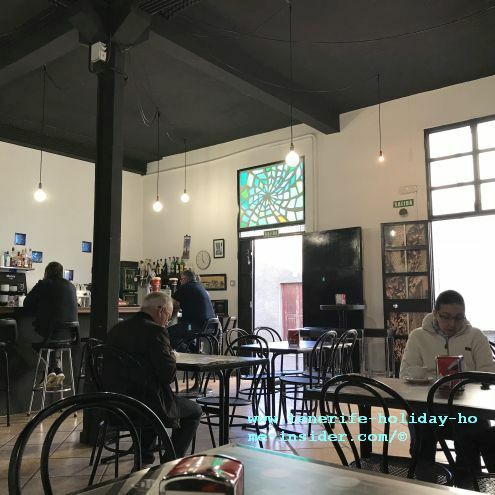 Since about October 2018 Dévora Café called a Cafeteria by the locals is in Calle Estrecha,15. It is the next good place when you are hungry and come from the Charco. The Dévora has much on offer for buying lunch or supper or to just have a coffee or any drink. Find it near the Caixa Bank just off the Church place Plaza Oramos. From February 2019 onward you may eat al fresco on a terrace upstairs as well.